In the first and second parts of my review of Tron: Legacy, I talked about the things I liked and did not like about the movie. But what are the messages in T:L? There are many I can recall, but I’ll focus on three. The first is the impact a father makes on his children, either through his presence or absence. 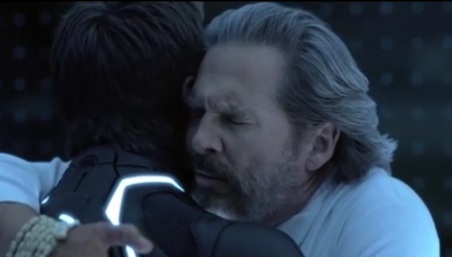 In T:L, Jeff Bridges’ character, Kevin Flynn, is held captive inside a computer world leaving his son an orphan. Later, Sam Flynn as a young man obviously has a lot of questions and problems – all stemming from his father’s disappearance. One thing I find very irritating about a lot of movies is how they consistently portray how a heroic figure can avoid or be withheld from his responsibilities as a father and later make up for that crucial lost time in a short span. Star Trek III and Indiana Jones IV both come to mind as examples, and T:L is no exception in its propagation of this myth. Still, I appreciated how Sam’s troubles are linked to his father’s absence and how the two men reconciled and worked together to rebuild a relationship stolen from them. A second message is a warning about how the ends don’t justify the means. In the back story of T:L, Kevin Flynn creates a duplicate of himself named CLU to help him build a perfect world. When an unforeseen source of imperfection is introduced, CLU takes his mission to create perfection to the extreme, even to rebel against his creator and to carry out genocide and totalitarianism. There is a good moral in T:L about the ends vs. the means, how it can happen, and the results. The last message I will point out is the heavy-handed portrayal of Zen Buddhism. 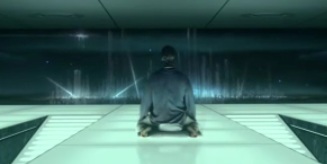 Flynn is often seen in a state of meditation and makes references to transcendental wisdom. In several interviews (one linked here), actor Jeff Bridges who plays Flynn, talks about how he consulted with his Zen master on how to inject Buddhism and religious meaning into the film. As a Christ-follower, this came into conflict with my worldview. Wisdom can’t be revealed to us from God and at the same time be hidden within us to be discovered through introspection. All in all, I’ll rate Tron: Legacy as a solid ‘B’. Visually, it knocked it out of the park; unfortunately, the plot was a bit too derivative and shallow. There were some good messages throughout, but I’d caution movie-goers a Buddhist worldview is prevalent. So what did you think about Tron: Legacy? This entry was posted in Ethics, Philosophy, and Religion, Reviews, Speculative Fiction, TV and Movies and tagged Buddhism, Christian worldview, Ends vs Means, Fatherhood, message, movie reviews, movies, science fiction, scifi, Speculative Fiction, Tron, Tron: Legacy. Bookmark the permalink. I’m so glad to have found your website…I am sitting watching T:L with my children (8 yob and 6 yog). We are a christian family, and I was looking for worldview type things to talk to them about when it’s over. Thanks for your review!